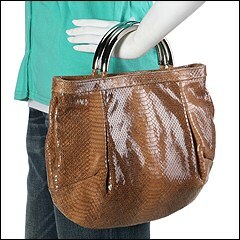 Both modern and exotic, this shopper from Furla is sure to keep you in the spotlight no matter where you go. Made of python embossed leather. Holds your wallet, sunglasses and personal technology. Dimensions: 16 wide across middle x 3 deep x 10 high. ; Dual handles. Handle drop: 3 � length. Prim pleated design. Inside magnetic snap closure. Interior lining with a back wall zip pocket and multifunctional slip pockets.